WHAT IS INDEPENDENT STUDIES PERIOD (ISP)? The Independent Studies Period (ISP) is a three-week term in January that is an elective period of the Academic Calendar. ISP encourages all members of the Skoltech community (students, faculty, staff, researchers, visiting faculty/researchers/experts, etc.) 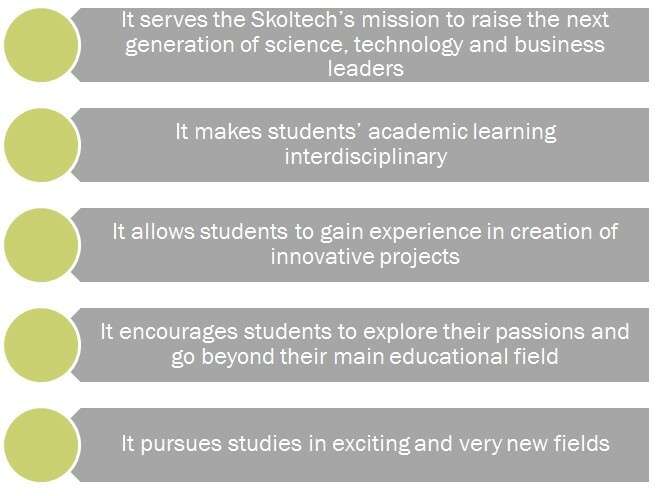 to create and participate in a wide variety of activities aimed at sharing an expertise or relevant interest with others, including ones necessarily related to their day-to-day Skoltech roles. This special term is primarily a requirement for first year Master’s students, but all students are welcome and encouraged to participate. What distinguishes ISP activities is their variety, innovative spirit, and fusion of inspiration and learning. You can also read Course Catalogs with the lists of all ISP activities 2015-2018 to get a sense of types of ISP activities of the previous Academic Years. Students can propose to lead their own courses, such as pilot school, aircraft manufacturing, software masterclasses, personal interest, and/or soft skills related. To propose your activity, follow the Guidelines for ISP course instructors in SIS. ISP Course Instructors will receive Certificates of Recognition for contributing to Skoltech’s educational process during the Independent Studies Period. ISP Course Instructors’ workload will be increased and calculated based on the formula presented in the ISP GUIDELINES FOR COURSE INSTRUCTORS. [Note: the following activities are not acceptable for ISP: sports activities, trips, internships in companies, games or any activities with large budget requirements]. 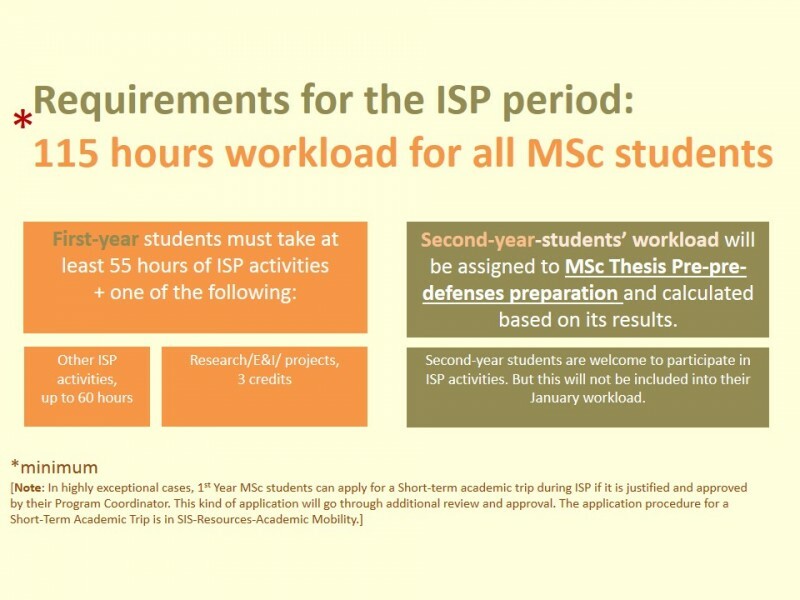 Most students will participate in ISP activities (depending on requirements – see below). Guidelines for ISP Registration are in SIS. Students can propose credit-bearing or non-credit-bearing independent projects (research/E&I). Detailed guidelines for course instructors and course participants can be found in SIS. The application procedure for a Short-Term Academic Trip is in SIS-Resources-Academic Mobility. Registration will happen in SIS. Drop/add for ISP-activities will be open throughout the whole ISP period. A deadline for initial registration will be announced to understand the workload and adjust the schedule. A separate deadline will be settled for short-term research/E&I/professional projects registration. ISP schedule will be available in SIS and on the web-site. Students will be graded pass/fail. Grading will happen in Canvas automatically during one week after the end of ISP based on assessment criteria loaded into Canvas by course instructors. 4. Participation in course evaluation. Based on these results, students will be assigned hours four ISP necessary for fulfilling full-time status requirements. WHO CAN HELP IN CASE OF DIFFICULTIES?
) with “ISP – 20__ (YOUR NAME)” in the subject line. Anastasia Zueva – general organization of ISP. Elena Cherenkova – logistical questions (schedule, classrooms). Boris Kheyfets –SIS and Canvas issues.